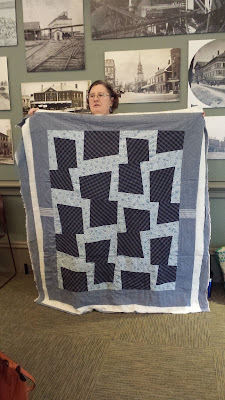 This morning, we enjoyed a wonderful presentation at the Newburyport Public Library from Michelle Wilkie, our Region 4 MQG representative and textile artist. 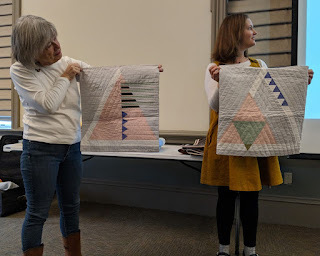 Michelle spoke about her design process and shared a slideshow and several quilts to illustrate her lecture. 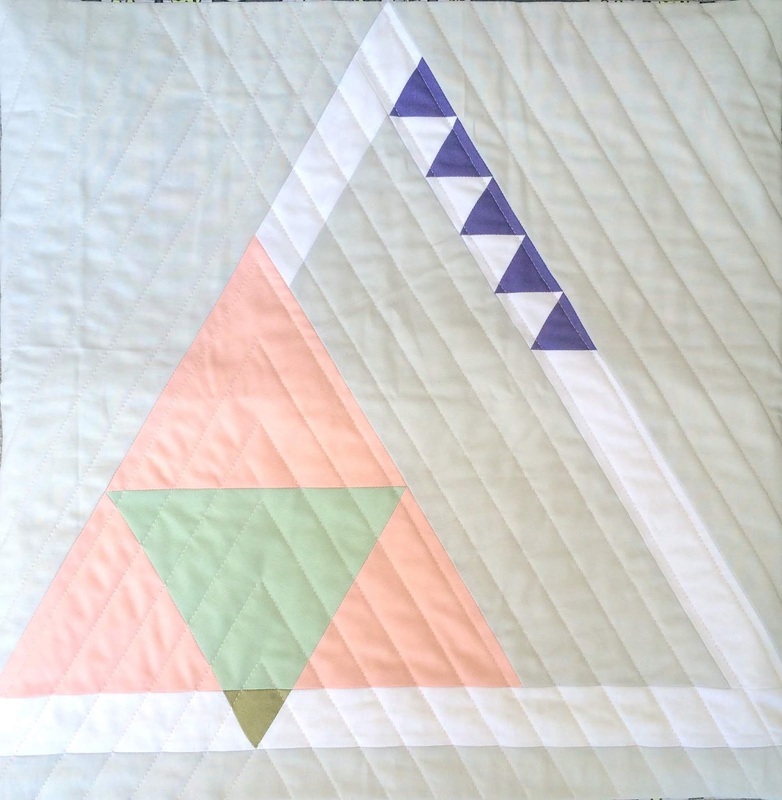 She is inspired by everything she sees from storm drains to aerial views. 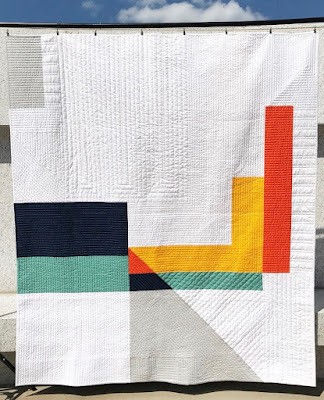 She takes lots of photographs and finds in them her inspiration for design as well as color palettes. The designs for both of these quilts were inspired by Tapa cloth. This quilt palette and design were inspired by a photograph of the Colosseum taken by Michelle...or her husband. There is a debate surrounding that point! 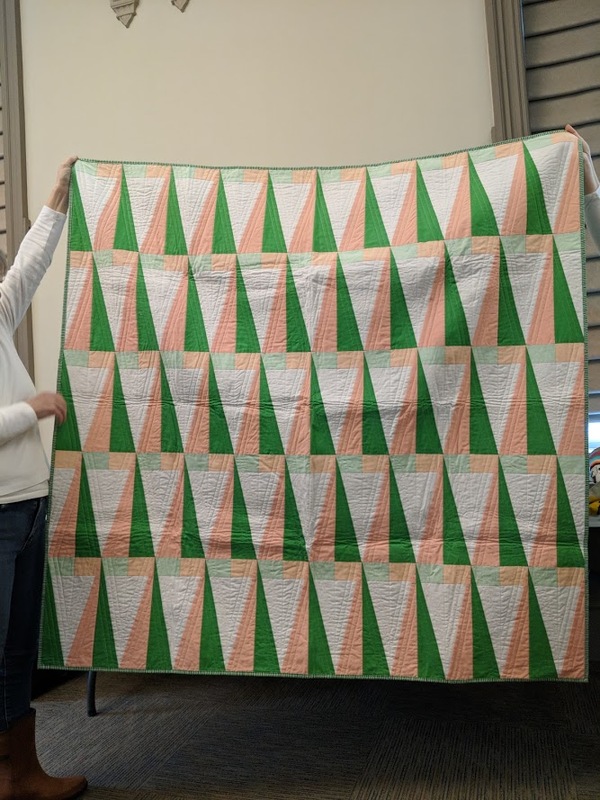 This quilt palette was taken from Design Seeds and is called Succulent. 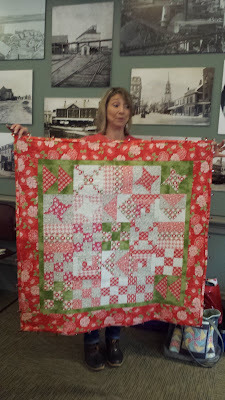 Michelle shared pictures of her inspiration, which do not photograph particularly well! 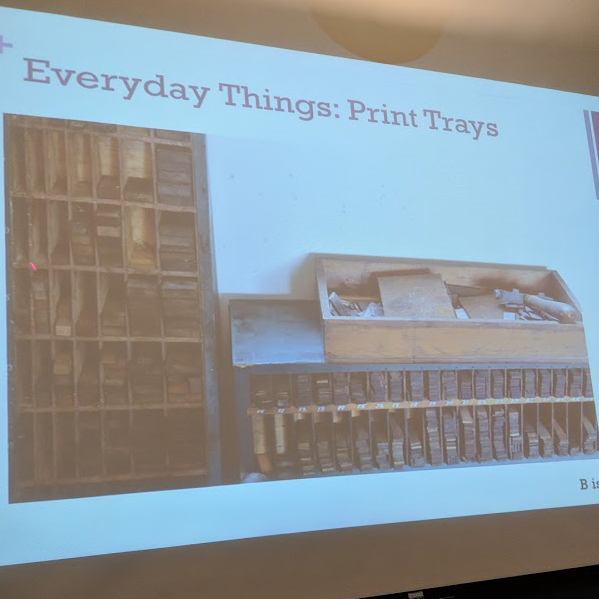 Here is one example though, of print trays, translated to cloth below. This last quilt will be featured in Michelle's upcoming, self published book! Please take a moment to visit Michelle's blog which you can find here. 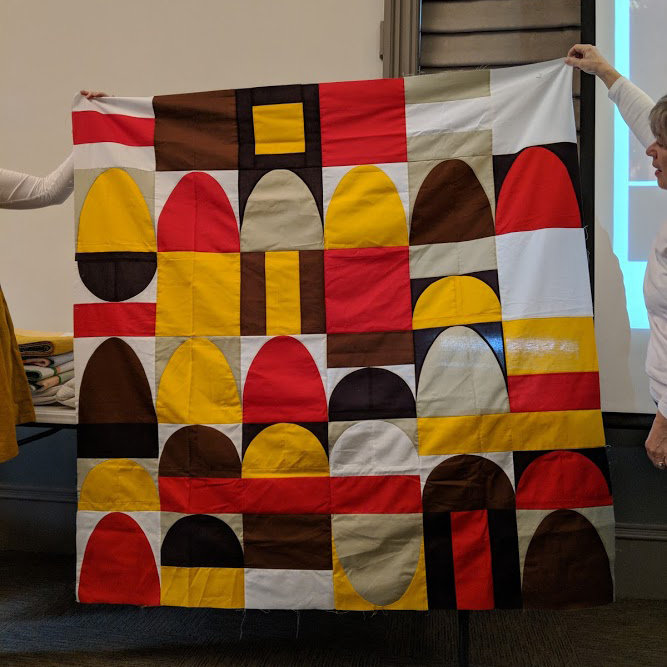 The Seacoast Modern Quilt Guild (SMQG) met at the Newburyport Library in Newburyport, Massachusetts on Saturday, November 3rd from 10:00 am - 12 noon. 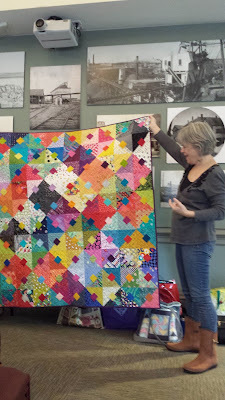 Judy opened the meeting, welcoming 21 guild members in attendance. Judy noted that the change in address for the guild will need to be made in the By-laws. The by-law change will be voted on at our December meeting. 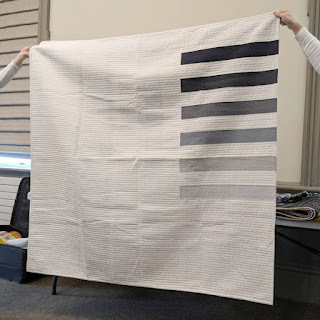 Judy provided follow up on the 2019 Quilt Con charity quilt, noting Andrea was binding and applying a sleeve to the quilt and will have it ready for the December guild meeting. 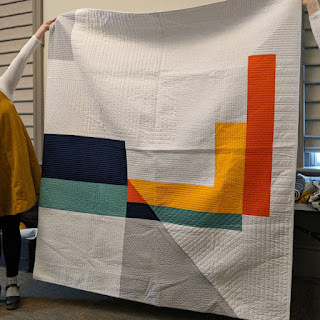 Thank you, Andrea, and everyone that contributed to this special quilt! 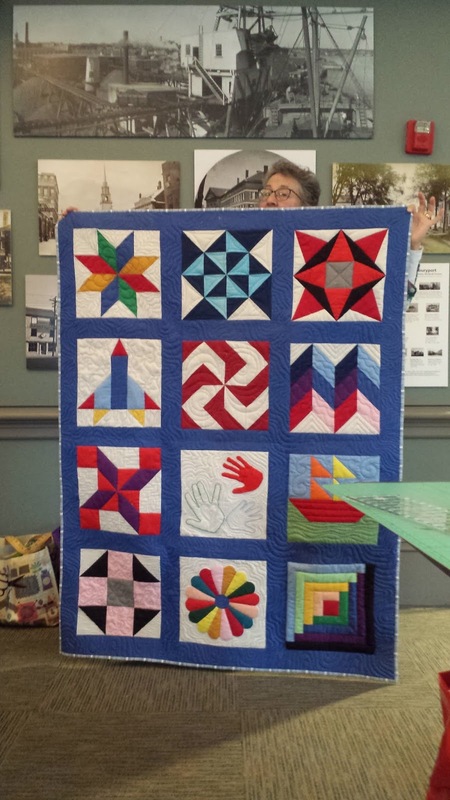 As per our by-laws a vote was taken by show of hands to decide if the membership wanted to renew the guild's membership in the MQG. 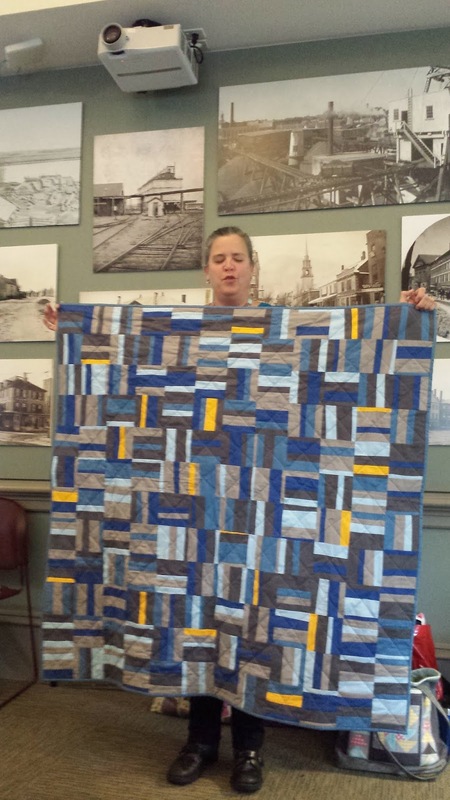 It was decided unanimously that the guild will renew that membership. 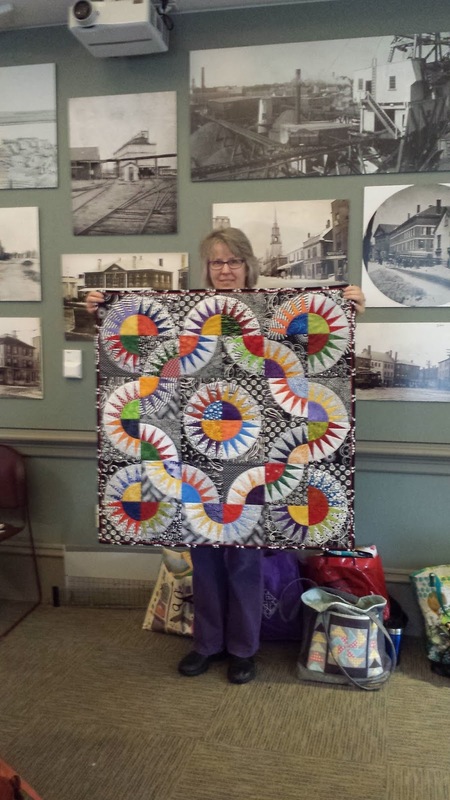 Secretary – Barbara Mahoney (It should be noted that Colleen Haggerty has volunteered to help Barbara by handling social media posts. 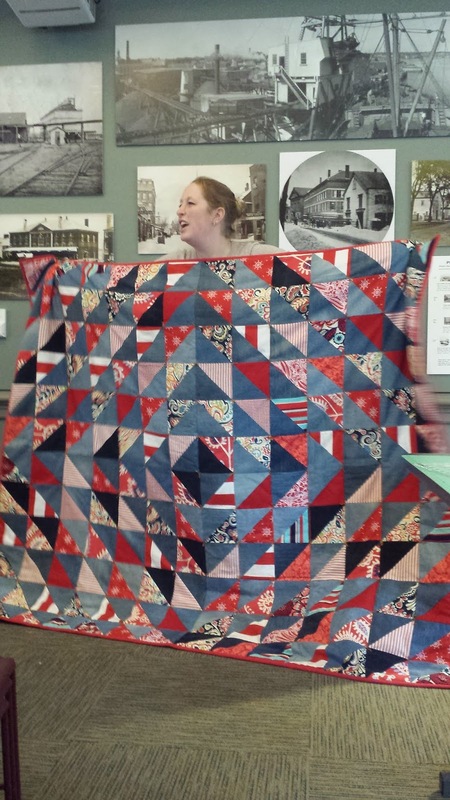 Drafts of 3 new policies were emailed to all members prior to the meeting for review. The policies concern Reimbursement, Fee and Refund, and Budget. The majority in attendance agreed that more time was needed to review the policy drafts so discussion was tabled. Members can email the board with feedback over the next 2 weeks. The Board will review all feedback at the end of this 2 week period, update the draft document as appropriate, and resend out to the guild membership prior to the December meeting. Discussion and voting on these will take place at a future time. The December meeting will be held on December 1, 2018 at the Annex in West Newbury from 10:00 AM to noon. 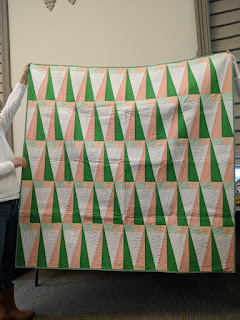 This will be our annual end-of-year holiday party .featuring a Yankee Swap, a game with fat quarters (Left-Right-Center), and a potluck brunch. 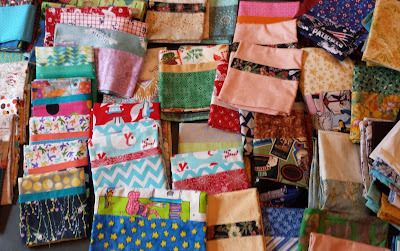 Members who would like to participate in the swap will make a shopping bag tote. Judy brought an example of the tote and has included a link to the Roomy Grocery Bag tutorial here: .https://docs.wixstatic.com/ugd/6a20ff_afc2975fea3549f3ab78372bc4f347fa.pdf. The totes may be made in your fabric(s) of choice. Please place your grocery bag in an unlabeled gift bag. Members who would like to participate in the game Right-Left-Center should bring a total of 3 fat quarters 2 of which are solids and one that is an “odd or unusual” print. Lastly, members are invited to bring a brunch item to share, sweet or savory. It's best to come with a good appetite! 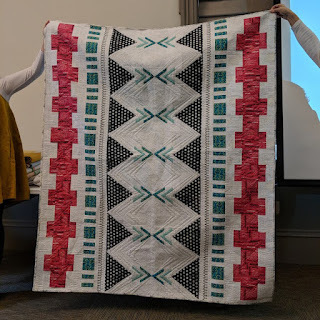 JoAnne provided an update on the 2019 SMQG Retreat, being held at the Franciscan Guest House in Kennebunk, Maine, May 2, 3, 4, and 5th, 2019. The same number of rooms will be available as last year, including single room options and multiple person room options. For those individuals that want to share a room, please make those arrangements with one another as the retreat committee will not be making room assignments. Reservations for retreat attendance can be made in one, two or three payments, beginning on February 1st, with subsequent payments due on March 1st and April 1st. 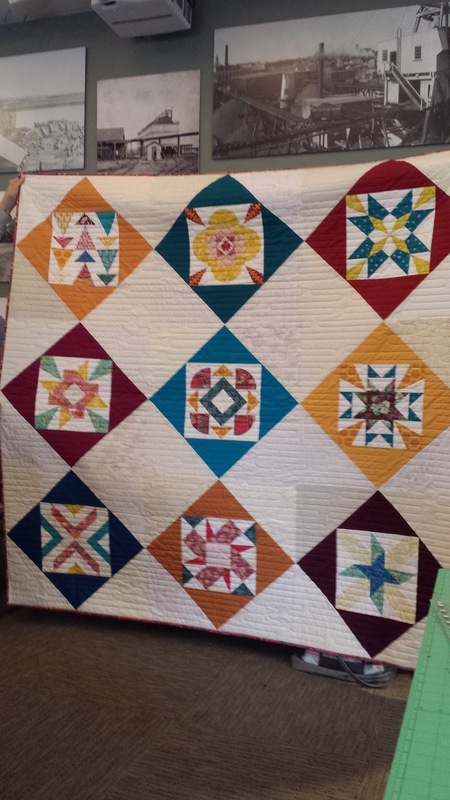 Payments may be made via cash, check, or PayPal. Payments made through PayPal will be assessed a 3% transaction fee. 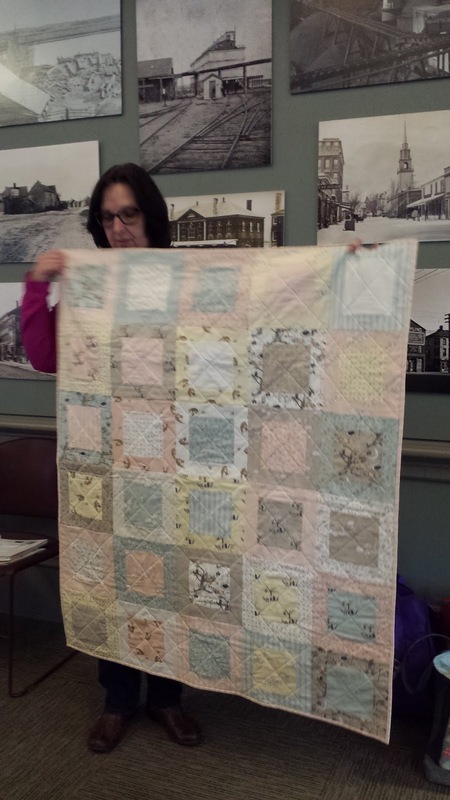 At the meeting, JoAnne shared two detailed handouts, (CLICK HERE FOR FLYER) and noted that additional updates will be forthcoming. 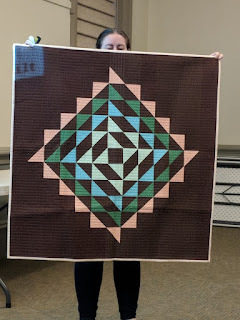 Jane B. provided an update on the multi-guild (SMQG, Cambridge MQG & NH MQG), multi-day Bryan House Quilt event being held October 25, 26, 27, 2019. 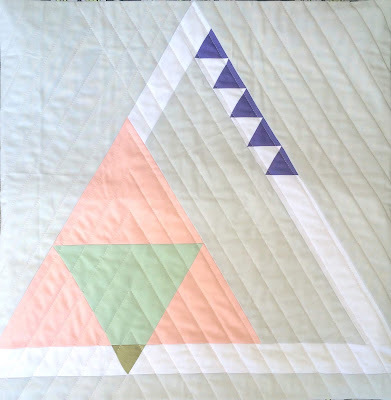 Rebecca Bryan will be presenting a trunk show on Friday and all day workshops on both Saturday and Sunday. 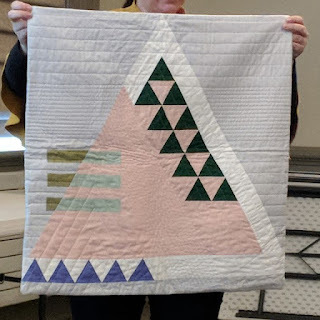 The “Playful Color Theory” workshop will be offered on Saturday and “Design Improv with Triangles” will be offered on Sunday. Additional details, such as event location(s), are currently being worked out. Updates will be forthcoming. 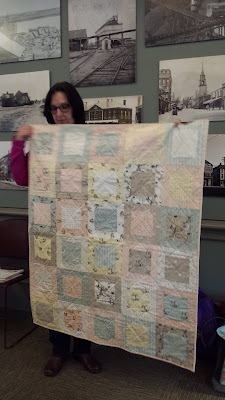 Our usual Show and Tell began with Jane F. sharing a darling baby quilt. 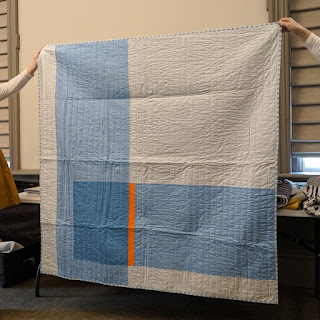 Kate Q. shared two prototype quilts for a quilt pattern she is designing, studies in color field reversal. 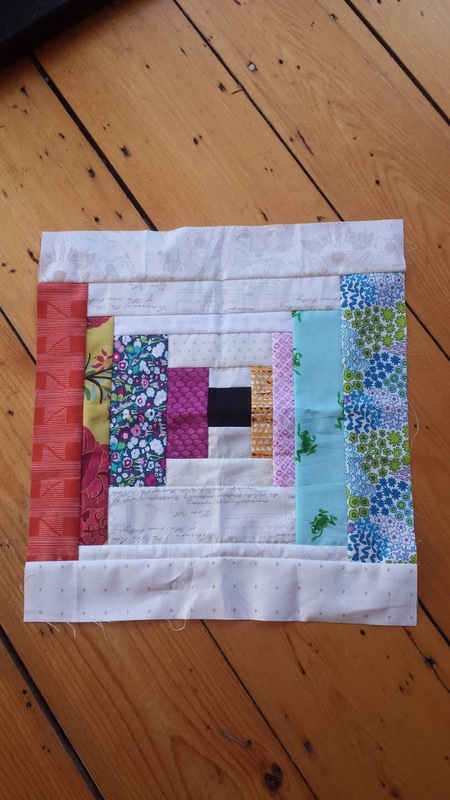 Based on a rhomboid, each block is a separate pattern and includes repurposed fabric. 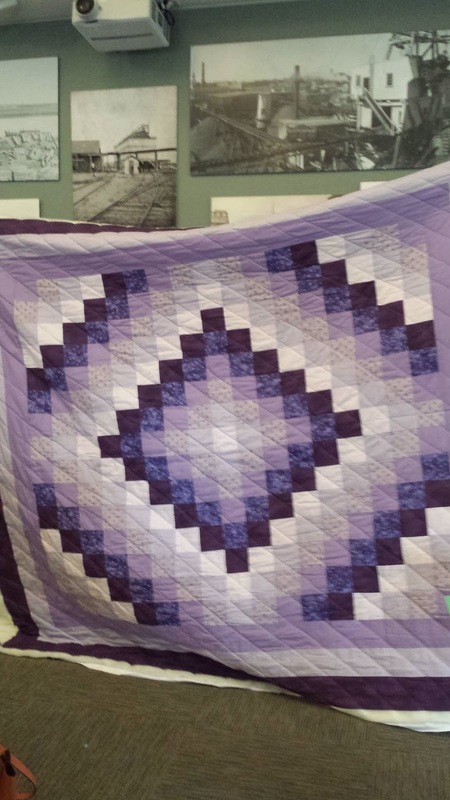 One quilt is for Kate’s son, and one for a friend. 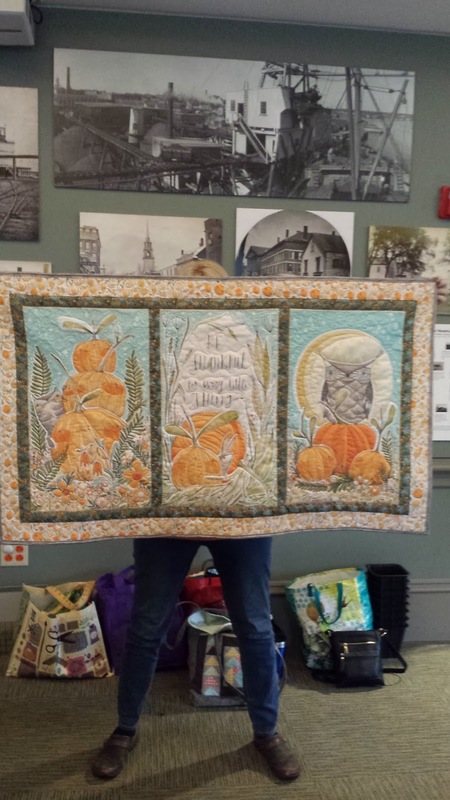 Mary O. is ready for the fall season! Her sweet fall panel quilt wall was completed with free motion quilting. 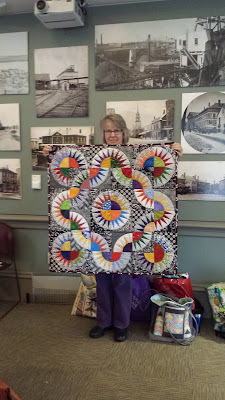 Sue Ann finished her quilt for Strawberry Banke on a Saturday; displayed it on the same day, and later that day, she sold it! The very happy recipient had apparently come back twice to view the quilt and was so taken with it, inquired about purchasing it. 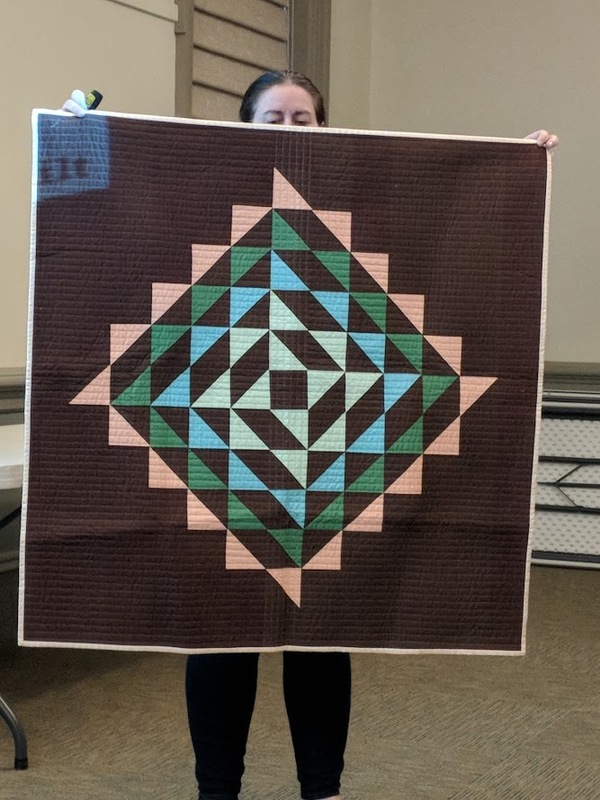 Lucky recipient! 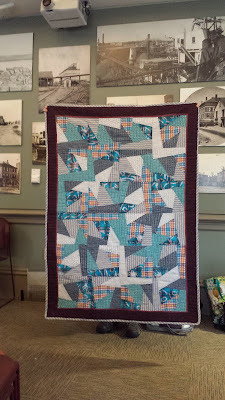 Lou's WIP challenge--Lou was the winner! 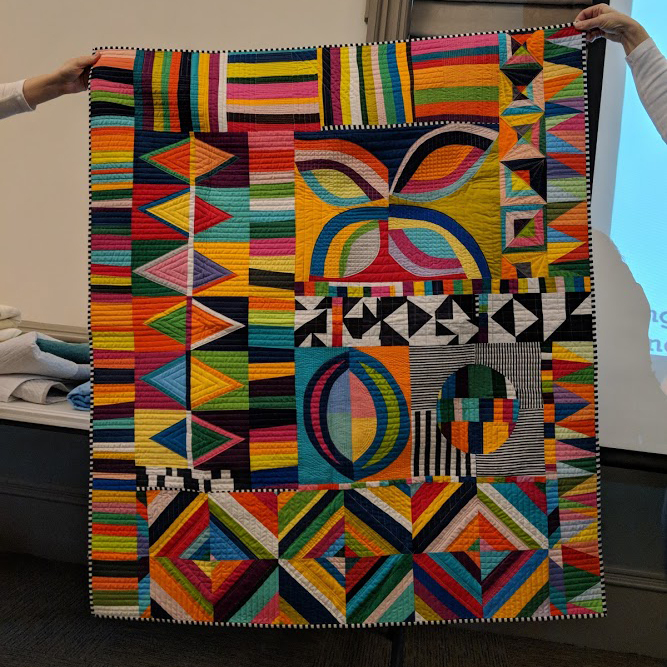 We ended the meeting with the finished WIP Challenge, each quilt with a story to tell. Each finished quilt earned a chance at a raffle prize. 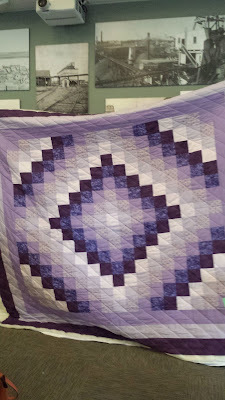 There were quilts that were begun many years ago, with one as far back as 1980. 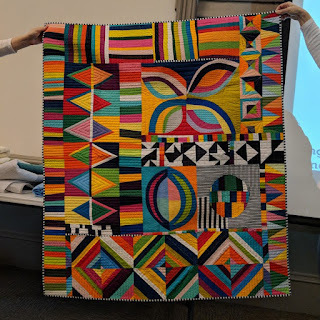 There were quilts that were challenging; some with intricate piecing methods; quilts that were hand-tied, hand quilted; ones that were made with all repurposed fabrics, and one that was inspired after a visit to the African American Museum in Washington, D.C. 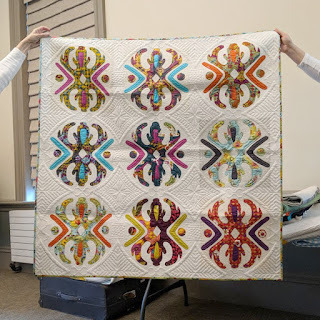 In the end, the winner of the WIP Challenge was Lou, whose beautiful starry quilt was made using up fabrics from her fabric stash! Congratulations, Lou! 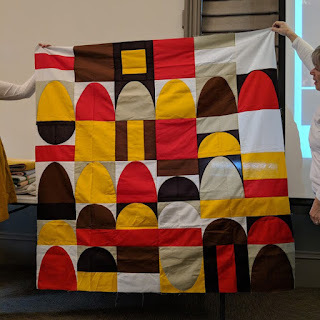 Following the guild meeting, a pillowcase sew-in, coordinated by Mary O. and Barb B., was held with a number of guild members. 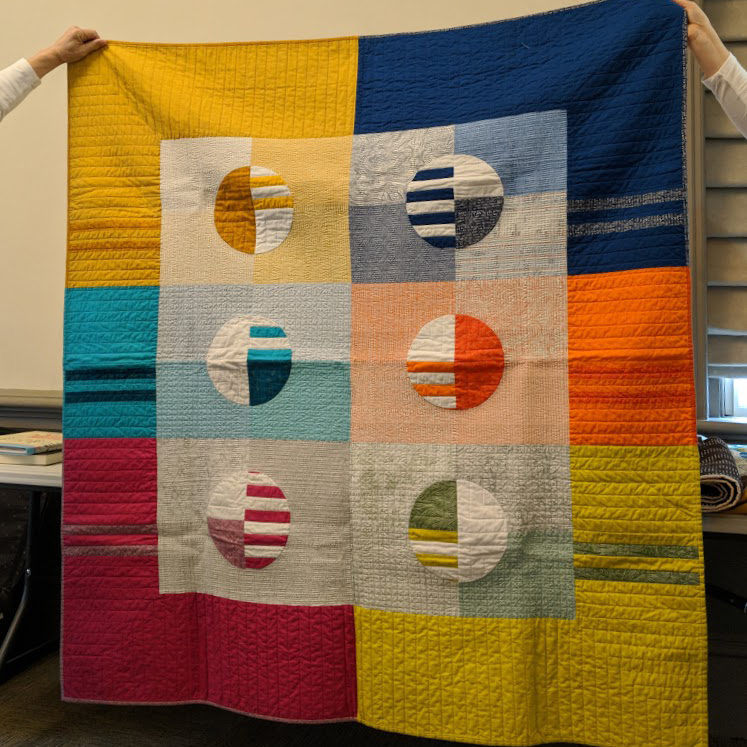 This project, planned over the past year, was begun as a way of providing a special, handmade, personal item to patients at an area health care facility. 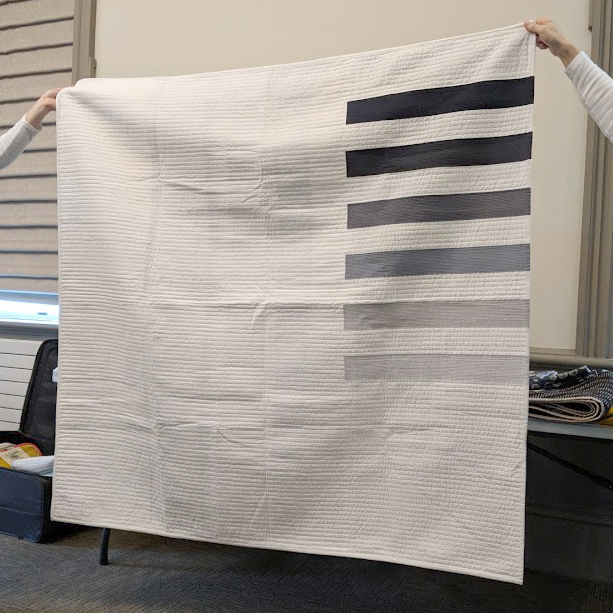 As many guild members had already completed a large number of these pillowcases, the goal of approximately 155 pillowcases was well on its way prior to Saturday’s sew-in. Saturday afternoon, we surpassed our goal, and it was evident from the beautiful fabric choices and stitching that each was made with thoughtfulness and care for the intended recipients. 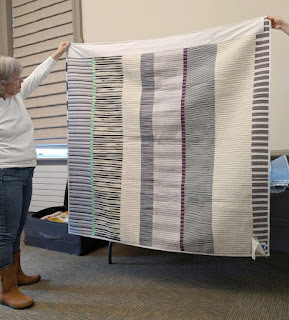 A very special thank you to Nancy Peach and her fellow guild members at the NH Bedford Quilt Guild who spent time during their fall quilt retreat making 34 pillowcases, and to everyone that gave of their time making pillowcases for this special project, a very sincere thank you. 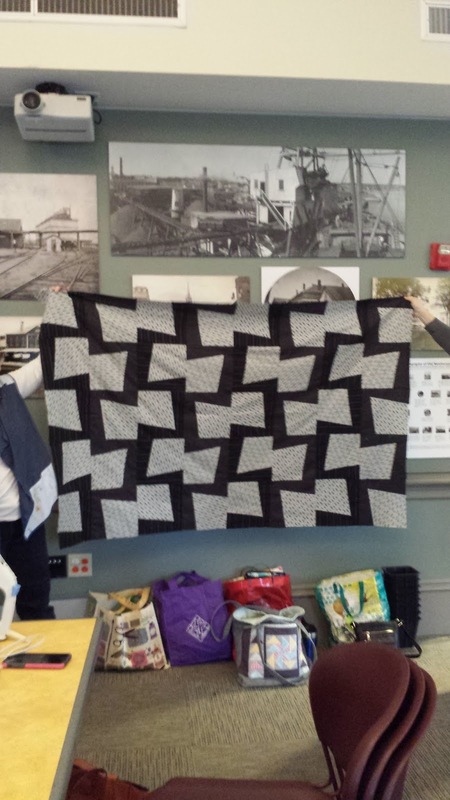 The pillowcases will be collected by Catherine Flowers and given to residents at the Tewksbury hospital. 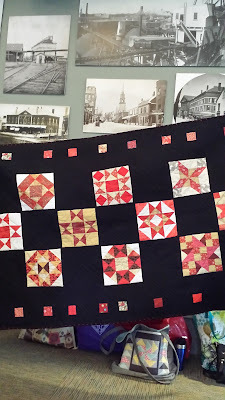 If you are working on yours at home please bring them to the December meeting. November 10, 2018 at the Newburyport library we have a guest speaker, Michelle Wilkie, coming to do a trunk show and talk about her methods and inspirations for modern quilt design. 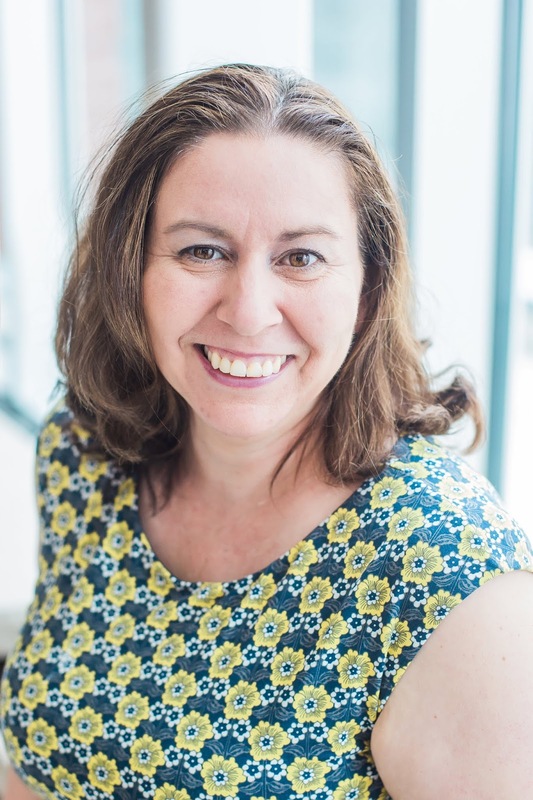 Michelle is also our regional representative to the MQG and you will have a chance to ask questions or express your opinions about the MQG. She is a member of the MQG board so this is direct access! The event is free to all. 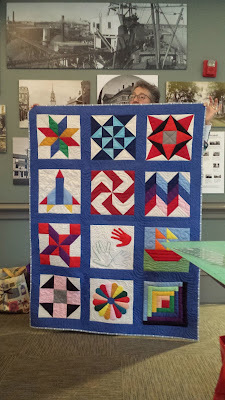 Bring some sewing friends! The Seacoast MQG is pleased to host Michelle Wilkie, designer, quilter, pattern writer, and MQG Region 4 Representative, for a talk on modern quilt design and inspiration. Michelle is best known for her minimal quilt designs that are often inspired by her own photographs of art, architecture, and everyday surroundings. 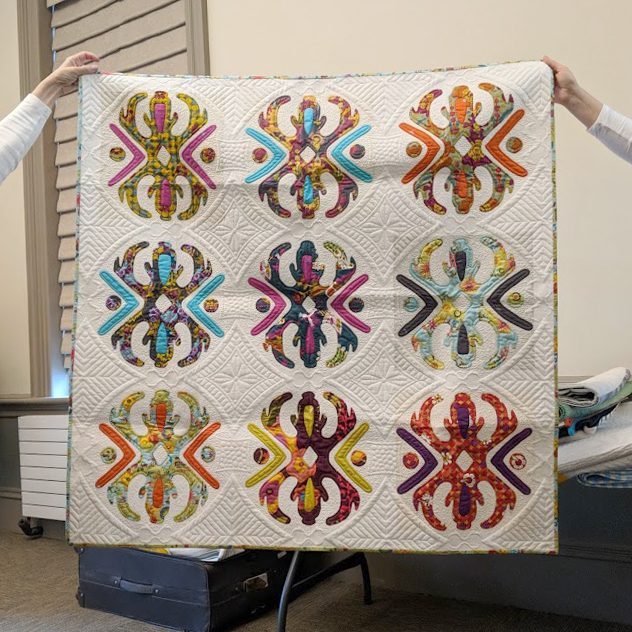 Her work with Quilt Design a Day (QDAD) results in many inspiring digital quilt designs, many of which she transforms into quilts that hang in shows or become patterns in magazines. 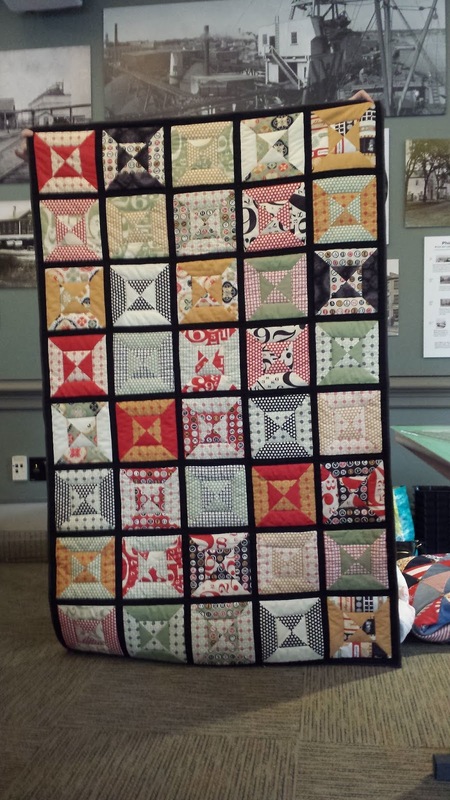 Please join us at the Newburyport Public Library, 94 State Street, Newburyport, MA on Saturday, November 10 from 10 am to 12 pm for Michelle's talk and a small showing of her quilts, plus a Q&A session related to her work as an MQG rep. This talk is free to all members and guests. 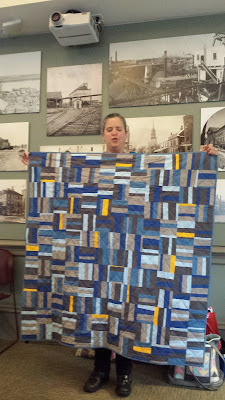 Please note that parking for the Newburyport library is in a municipal lot and there is a small charge for parking. The pay and display system accepts credit cards, and is a short walk from the library entrance.